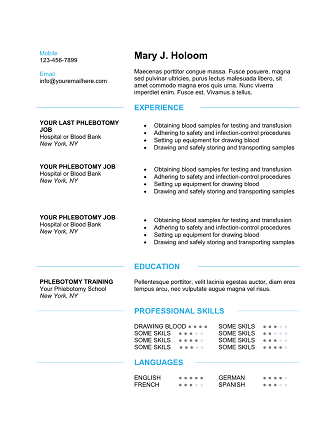 Description: Make an impact on your potential employer with this great phlebotomy resume. Modern and colorful, with a big top area that you can use to present your very best skills and straights, this resume will help you to conquer the eye and mind of your interviewer. 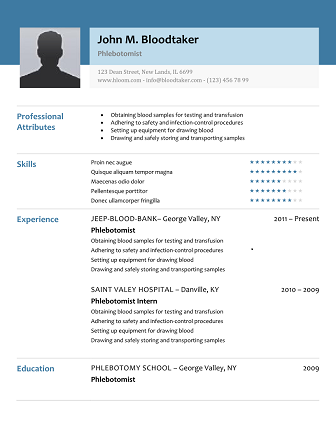 Description: Simple in design and easy to use, this phlebotomy resume is beautifully elegant. Perfect for a phlebotomy technician or a phlebotomy instructor. You can easily add your skills in the upper front area. 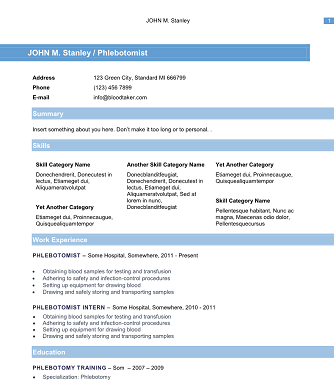 Blue is a perfect color for a phlebotomist resume, being catchy for the eye but conservative in the same time. You won’t get unnoticed with this resume. 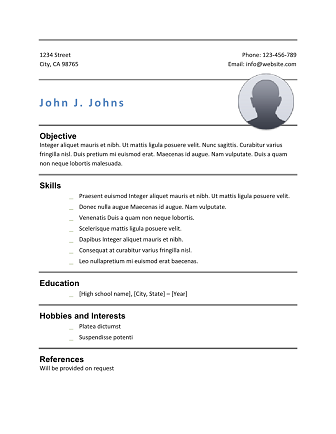 Description: This clean resume use very nice modern lines that will easily gain your potential employer attention. Your contact information will be highly visible since it is in the upper right side of the template. There is a nice area where you can list your skills with proper scores for each. If you master more then one language you also have a special section for this right at the end of the resume template. This is perfect both for experience phlebotomists and for young ones that want to make a good impression with their employer. 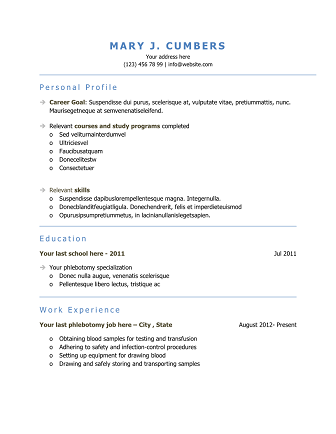 Description: This resume will let you put your picture up on top of the page, Facebook stile. It has plenty of sections that you can customize with your personal information. Modern and elegant, it will make a great impression. Description: The bold big name will make a great impression, that’s for sure! This design will help you get noticed from moment zero. 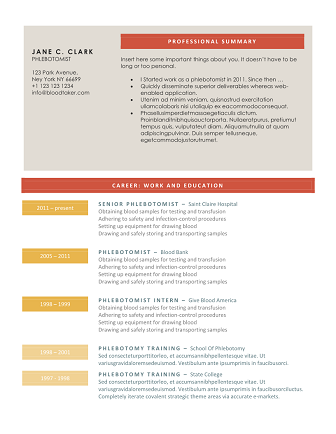 This resume is modern and simple, great for fresh phlebotomists looking for their first time job. 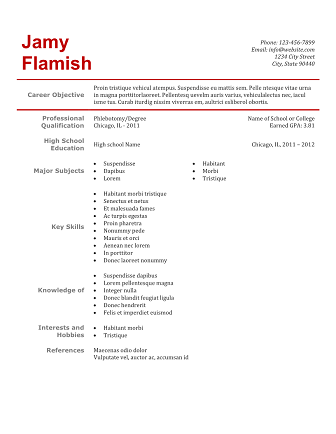 Description: This template resume is perfect for a fresh phlebotomy graduate looking for his or her first time job. The design is clean and modern, with just enough color to make it visible and pleasant. You can edit each section to add as many personal info you feel necessary. Description: Very subtle modern lines, just enough to make this design truly great. 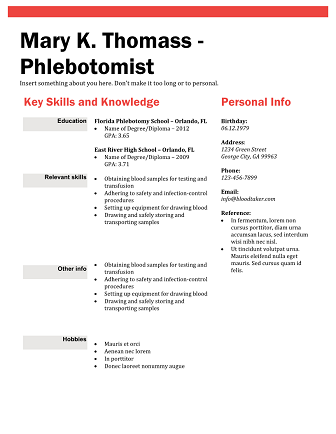 It is perfect for someone looking to get a job as a phlebotomist, being elegant and easy to read. You will have no problem to customize this template according to your needs. Description: You really don’t need a fancy design to gain the interest of your potential employer. Just a touch of color, clean lines and a bold big red name will do it. Edit this template with your own data and you are ready to apply with confidence for your next job. Description: Sometimes less is more and this is true when it comes to resumes as well. Many times the HR person in charge with reading all the candidates resumes wants only the basics and nothing fancy. Edit this template with your personal information and your are all set. It is great for a inexperience phlebotomist. You have the option to insert a nice picture of you for a little more impact. Description: Yes, modern is cool, but who says that traditional is bad? 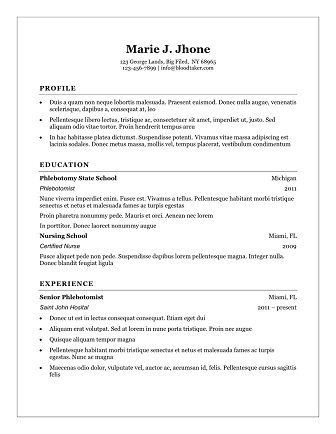 Some things are forever, and this is true when it comes to clean and simple resume design that put an emphasis on your experience and personal skills. 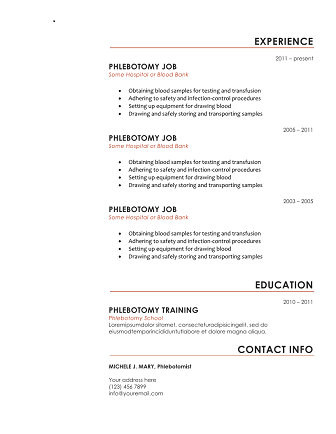 Using this template when applying for your next phlebotomy job will prove to be a good idea.